KOSE is one of those beauty brands that eschew a fancy packaging to let the efficiacy of their products speak for itself. And I am one of those who have stood testament to its sun protection range, one of the best I've used since I got SPF-conscious. 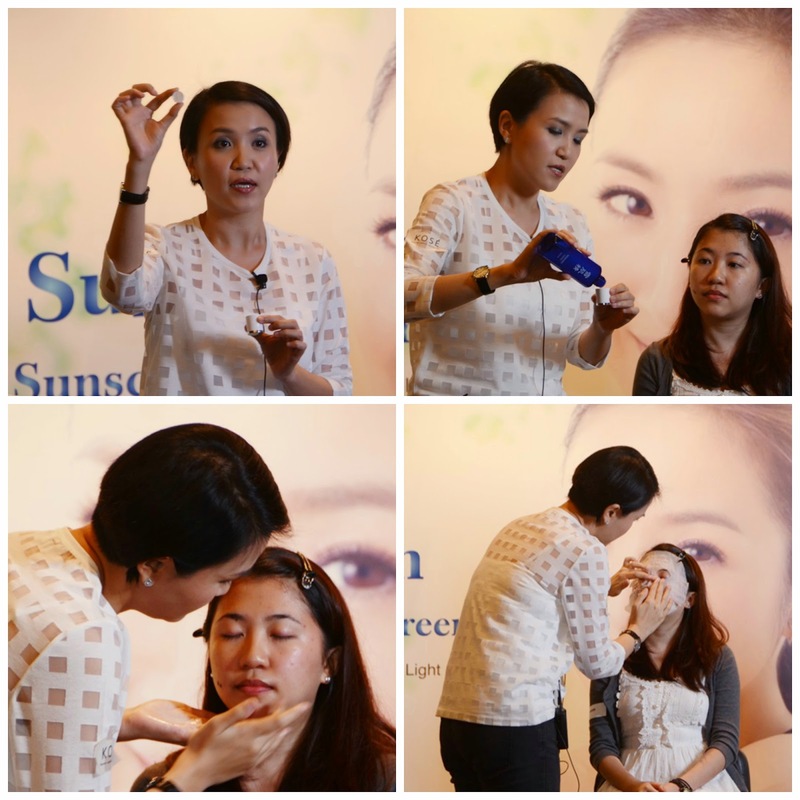 So I felt really blessed and grateful to be invited to attend their Youthful Radiance Beauty Workshop, with their celebrity ambassador (and one of my favourite Taiwan actrresses), Ariel Lin presiding the event! Aside from the star-sighting, each attendee had a doorgift which included a $30 redeemable voucher which they could use to offset to purchase for Kose and Esprique products...hows that for a great deal? Needless to say, I went to splurge on Esprique, which is one of my favourite cosmetics to turn to. 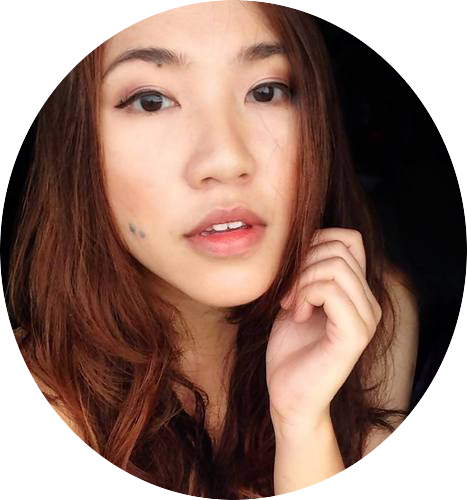 Highly-pigmented with shades that flatter Asian skintypes, yes please! There was also a express manicure corner in which ladies can redeem at no charge when they spent a certain amount. I also tried my hand at the sand art booth (and failed miserably), where attendees can DIY their own little bottle of sand art home, a sunny memento in theme with their sun-protection. This was my first time being seated right in the front row next to celeb blogger Hayley Woo, and Osamu Dobanshi-san, KOSE's inhouse make artist who had flown into Singapore specially for the event and whom I SWEAR can easy pass off as Taiwan celebrity Vaness Wu's long lost brother. 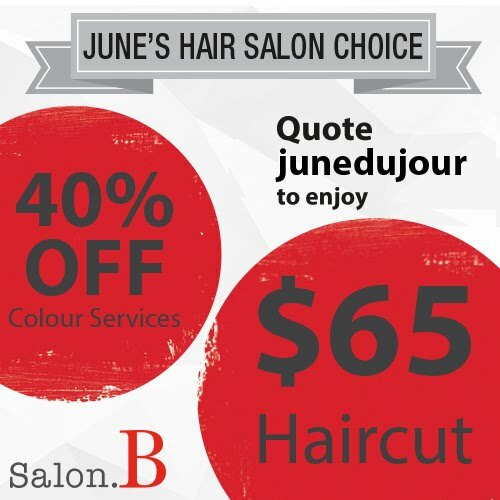 I know I heard a flurry of excited murmurings when he took to the stage to demonstrate on Hayley, how to easyily achieve a day look with Esprique's best-selling color palettes. With bated breath and cameraphones in hands at-the-ready, the room was packed to the seams with Kose and Ariel Lin fans alike as we waited for the Taiwanese celebrity guest of honour to arrive. I was rather excited to see her in person, considering I've watched quite a many of her Tv serials since my teenage years. Will she look the same as her on-screen persona? The answer came never a moment too soon. Ariel was as perfect in real life; slightly shy but exuberant doe-eyed sweetheart who greeted everyone chirpyly as she walked onto stage. What Cleo is using here is the Sekkisei lotion mask (it comes super compacted into a small tablet-like form), which is expanded into a sheet mask after being soaked into a capful's worth of Sekkisei lotion, before fitting it onto my face and leaving it for about 10 minutes to let skin absorb the moisturising goodness. I notices how the redness of my blemishes lessened and my complexion looked slightly more radiant after use. Plus, it does not leave that sticky after feel when removed. Inserting abit of fan girl moment here: OMG Ariel Lin touched my face! What a moment to remember! But I must say, she seemed abit hesistant on slathering more product on my face, althought I kept telling her it was ok to do so. After the demo, the lovely Cleo gave me a sweet-looking day look so that I didn't have to continue going about the day bare-faced (and scaring people). Achieved through Esprique A-1, which I later ended up buying as I loved the look so much. Some very lucky fans also won some amazing prize hampers which consisted of their best-selling Save the Blue skincare series worth more than $100, and got them specially delivered by Ariel herself! And of course the highlight of the day..... I got an exclusive picture with Ariel Lin herself! Since I was so close to her, I took a good clear look at her skin and I can just tell you now... the woman is FLAWLESS. I even doubt there was much makeup on her, she just had this natural glow that seem to emanate from within. Gorgeous! The kind people of KOSE also surprised me with a bag of after the show, and I cannot wait to try out and review. 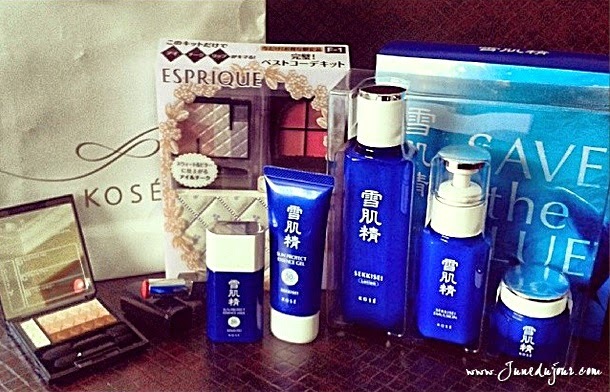 Included in it was the Kose's Save the Blue Sekkisei skincare range. Using oriental plant extracts to help you get more hydrated, translucent and radiant skin. In support of coral-reef preservation, the beauty brand presents the limited edition trial kit comprises of Sekkisei Lotion, which tones the skin, Sekkisei Emulsion, which brightens and hydrates skin, and Sekkisei Cream, which improves skin radiance and moisture balance. I would really love to extend a sincere note of thanks to Cleo and Yvonne from KOSE for the kind invite, really had a fun and exciting day. Here are some of the video highlights that happened at their event! Plus, do help to support and vote for their Sekkisei Cinderella contest which is going on now!